And free from artificial colors n preservatives !! beet juice to make the scary red veins . a greased hot skillet ,cook from both sides till done. to the cooked rice . Shape into balls. Top with pickled gherkins . Commonly known as Chinese tea eggs . have a spooktacular Halloween !!! I loved the tortilla ghosts and eyeball very much! so cute! I am going to try making that jack o lanterns....great job! 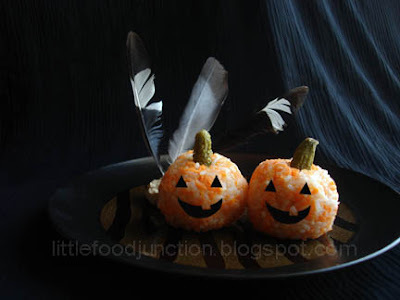 Ha, what adorable and creative Halloween edible! I just love it! Wow! Beautiful creations and lovely presentation!! Brava! Your attention to detail is perfection... well done!!! You are very talented!! These are so adorable, even my 17 year old son like them. @ Preeti - Do post ur creation on ur blog i'd love to c ! @Manya-Deeply appreciate ur comments Manya . @Hannah- I'm so glad that u love my creations Hannah !! @Ellie- Thanks so much Ellie !!! @Amanda- Thanks for ur kind words Amanda !!! @Diana h -Thanks Diana . I'm glad that ur son liked them. so much fun our blog!! i like to play with food, am sure my kids will love too. Wow...very nice cooking and decorating skills. You paid my blog (www.lisagoescrazy.blogspot.com) a visit a while back, commented and suggested I visit your..it took me a little while but I am very glad I did. Thanks for sharing...keep it up! You have some great ideas!